You know how important WiFi is to you when you travel. In fact, over the last decade, Wireless Internet has risen to become the most important commodity in hospitality. Matrix Networks has been designing, installing and providing guest support for WiFi in hotels, motels, resorts, RV parks and marinas since 2000. Our focus on your industry ensures we know how to design your WiFi network based on the shape, material and environment you need covered. Our Portland, OR based call center is here to answer calls from your guest, ensuring the experience they have on WiFi is supported by experts. We understand that WiFi has quickly become the #1 amenity offered, and therefore it is critical it provides excellent coverage, is highly secure, fast and reliable. WiFi is an important amenity, but also comes with risk. We monitor your network for performance, malicious threats and illegal downloads of copyrighted content, protecting you from legal action. 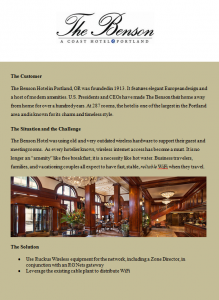 Why Ruckus Wireless for Hospitality? Recognizing this trend, Matrix Networks set out to find a partner who truly understands the dynamic environment that comes with WiFi for hospitality deployments. We found that partner in Ruckus Wireless. Ruckus understands that wireless is no longer just another amenity at hotels, it has become a prerequisite for doing business and enjoying ones stay, period. 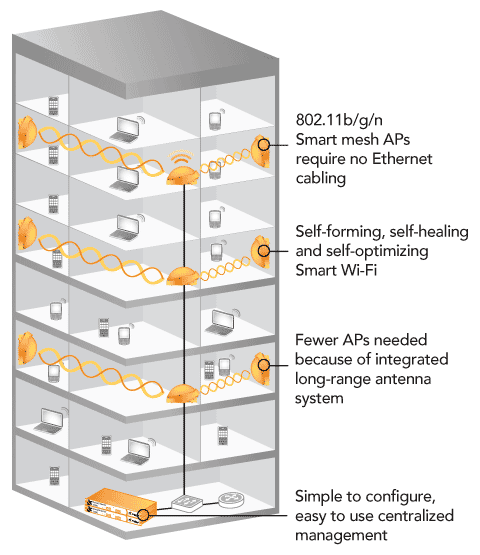 If you understand the unique importance of “Smart Mesh Networking with directional, high-gain RF signal routing, and centralized management with 802.11ac” then good for you. If not, you can understand this: you want WiFi that simply works. Your guests don’t typically know what 802.11ac stands for either. They do, however, understand connectivity. With Matrix Networks and Ruckus Wireless, you are deploying a solution backed by a team of reliable, experienced, and professional individual. It is our goal to make sure your organization has the coverage you need and the connectivity your guests deserve. Every hotel, motel, and resort is different. At Matrix Networks we know that, and we aim to give you the solution you need. We do that by using cutting edge technology that allows visibility into each unique hospitality environment. We are able to map out a plan for success and, when we implement Ruckus APs with “Adaptive Signal Control”, we’re providing you the best possible coverage and your guests the best possible experience. Turn your wireless solution into a revenue generating mechanism that allows each AP to support up to eight discrete networks, each of which can be configured with their own policies. For example, we can configure and enable preferred access, higher-speeds, and application specific network services for each network. Of course the choice to include a tiered service for WiFi is up to you; Matrix simply gives you all the tools to achieve your goals, including solutions for revenue generating gateway exchange, customer splash pages, and even advertisement overlay. Learn more about revenue generating gateways here. When Matrix Networks set out to find a partner for WiFi for hospitality we did extensive, exhaustive research. Sure we tried all the brands you’ve heard of and all came up short. Ruckus Wireless was the only provider that consistently delivered the desired speeds that matched our expectations and routinely passed the tests for reliability, accessibility, and signal strength.